To achieve these catastrophic sea level rise amplitudes, however, both the rate of increase and overall acceleration will need to be elevated dramatically – by more than an order of magnitude – from that which has been observed in the last century. Pacific tide gauges sited in the same location for a century or longer (with consistent rates of subsidence or uplift) can qualitatively assess the overall rate or acceleration of sea level changes. Shorter-term (less than 80 years) measurements may easily compromise the accurate computation of rate or acceleration trends due especially to the prominence of 60-year cycles of natural origin (Chambers et al., 2012). Separating an alleged anthropogenically-forced sea level rise trend from natural variability has been a well-documented problem that has been intensively debated in the scientific literature. It has already been suggested that an anthropogenic fingerprint has yet to be detected in Pacific Ocean measurements of sea level change due to the overriding presence of natural variability. Further supporting the conclusion that an anthropogenic fingerprint has not yet been detected in sea level data, a compilation of records from 30 long-term Pacific Ocean tide gauges has been made available in a new paper (Parker, 2019) published in the journal Ocean and Coastal Management. The averaged measurements from these 30 tide gauge instruments reveal a negative trend in both the rate of sea level rise (-0.02 mm/yr) and acceleration (-0.00007 mm/yr2) since the early 20th century. Observations of negative sea level trends for the Earth’s largest ocean basin while CO2 concentrations rose from about 300 ppm (1900 C.E.) to well over 400 ppm obviously do not support the narrative that says anthropogenic CO2 emissions are a driver of relative sea level changes. 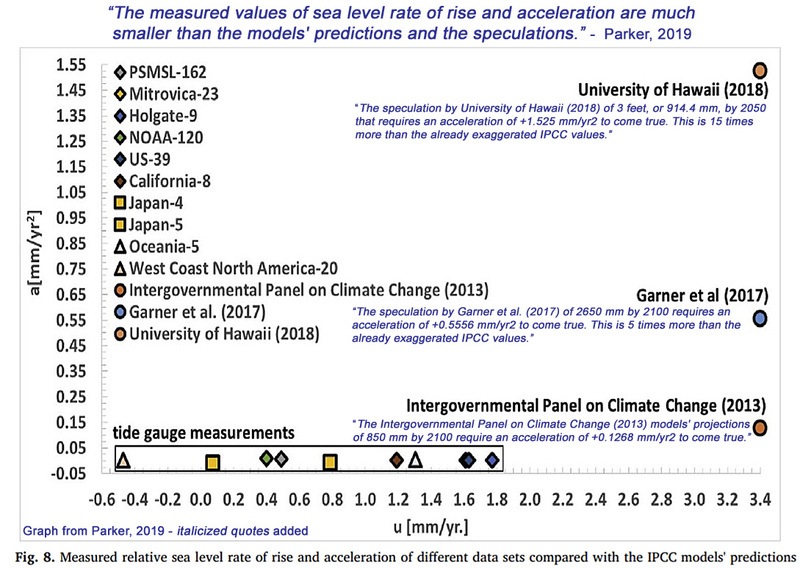 Climate model-based projections of meters of sea level rise by 2100 promulgated by proponents of human-induced climate alarm may therefore be categorized as both speculative and dubious. • the Intergovernmental Panel on Climate Change (2013) models’ projections of 850 mm by 2100 require an acceleration of +0.1268 mm/yr2 to come true. • the speculation by Garner et al. (2017) of 2650 mm by 2100 that requires an even larger acceleration of +0.5556 mm/yr2 to come true. This is 5 times more than the already exaggerated IPCC values. • the speculation by University of Hawaii (2018) of 3 feet, or914.4 mm, by 2050 that requires an even larger acceleration of +1.525 mm/yr2 to come true. This is 15 times more than the already exaggerated IPCC values. Thank-you Ron a most impressive blog post at your site (yes Science Matters). Of course there are some that frequent this site that insist the warm atmosphere can heat-up the oceans, and that the poles are loosing ice at an unprecedented rate. But as he is just another (and probably paid) cAGW advocate no one rational takes him or his nasty and irrelevant comments very seriously. Indeed: During the last ice age the sea levels were 400 feet below what we have today. And yet a carbon tax? The climate tax will surely be a boon. Just by looking briefly at the paper, I notice that the author does not calculate standard deviations, neither for the rate, nor for the acceleration. Just looking at the data scatter in his graphs, I reckon, the errors would make the actual numbers overlap with zero. Language like this should be unacceptable in any scientifc publication. What kind of review did this go through? Did the author only look at those to make his unaccaptable point? Did SebastianH miss the part of the article where it talks about assessments of acceleration can only be made with trends lasting longer than 100 years due to natural variability? None of his links satisfy this requirement. Did SebastianH miss the part about using tide gauge data from regions where substantial and inconsistently oscillating subsidence and uplift trends did not skew the data in either direction? Does SebastianH understand the difference between saying “sea levels are not rising around Japan” and “The Japan Meteorological Agency (2018) has shown that the relative rise in sea level on the coast of Japan has stabilized since the beginning of the 20th century and has not accelerated”? Does SebastianH understand the difference between commenting on the rate of rise and the acceleration vs. the overall linear rise or fall of sea levels? 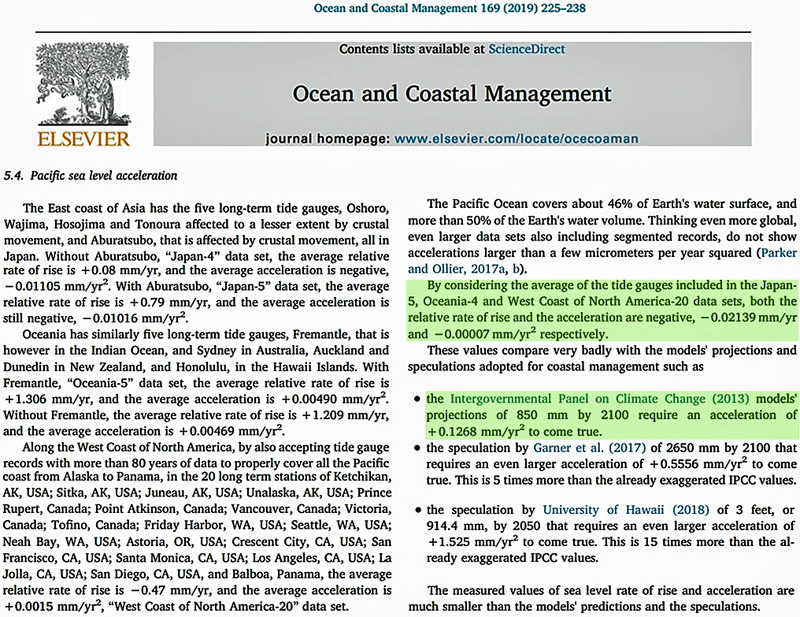 Did SebastianH even bother to read the paper for answers to his questions before he accused Ocean and Coastal Management of not peer-reviewing their publications? 👍 on your observations on SebastianH comment, and would this be yet more evidence of SebastianH dismissing a scientists’ paper just because he dislike the message in the title as it runs against his profoundly held beliefs? Certainly he does not seem to have read the paper. Ok, let’s take 20000 years then. 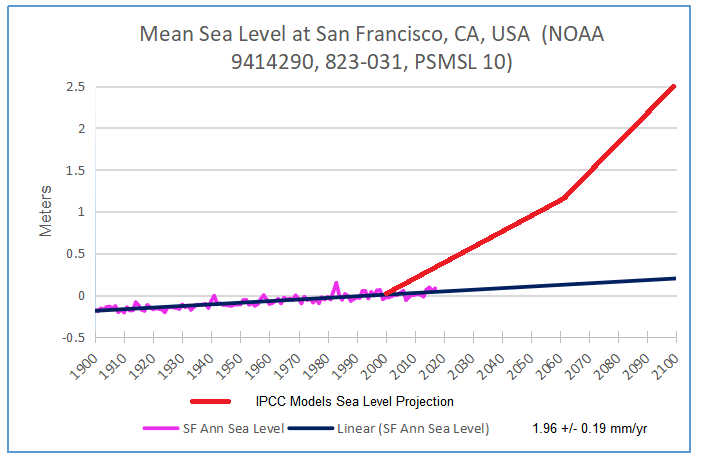 I get a rather large increase in sea levels … now what? Sorry, but skeptics search for data that looks like it supports their claims and ignore everything else. It has been this way since I got to know you guys. I am not commenting on the merrits of this paper. I commented on the language used and the Pacific trend claim expressed here. Are you trying to troll me on purpose? Let spike55 do that please … it’s more enjoyable to read what creative stuff he comes up with. Let’s take 5,000 years. Sea levels have lowered by 2-3 meters since then. Now what? What kind of review did this go through? I am not commenting on the merrits of this paper. Is questioning the peer-review process for a paper not a comment about its merits? No need to be sorry or apologize SebastianH just because you have it wrong yet again. We skeptic look for the real, observed processes that are the most relevant and likely ones to affect climate and its changes. There are many, most are quasi-cyclic as the scientifically analyzed history of this planet’s climate shows. You and you band of cAGW advocates just complacently assign one (maybe 1½) process to global warming and therefore the control of climate. This is obvious nonsense as so many proxy analyses show CO2 does not control the climate (or weather). You, and UN-IPCC cAGW advocates, have so little observational evidence and support therefore that CO2 paradigm is very, very unlikely, more probably utterly wrong. Yet people like you (the cAGW congregation) still erroneously claim a 97% consensus among scientist — that’s evidence of the cAGW congregation’s lies, just like the ‘climategate’ emails. We skeptic look for the real, observed processes that are the most relevant and likely ones to affect climate and its changes. You really don’t. That’s what you tell yourselves. In reality, you are trying to justify an irrational belief of how the world should work with whatever sounds promising to support that belief. If you’d look at the actual processes there is no way one can’t recognize what is going on. It’s especially mind-boggling when one observes you guys argue against established physical mechanisms as if you have not the slightest clue what those are. You and you band of cAGW advocates just complacently assign one (maybe 1½) process to global warming and therefore the control of climate. This is obvious nonsense as so many proxy analyses show CO2 does not control the climate (or weather). Actually, they do show that large CO2 concentration increases that happened for another reason than a warming planet, caused climate to change quite often. But you are right, no proxy has ever shown that human CO2 caused any climate change … since well, it never happened before that a species emitted did what we did. What? Literally all the evidence points to this. You really think this is just some conspiracy imagined up by those out to control you, do you? Says the one who just trolled me. Hmm ..
It’s especially mind-boggling when one observes you guys argue against established physical mechanisms as if you have not the slightest clue what those are. And what might the “established physical mechanism” — found in real world observations — that tells us how much water cools when the CO2 concentration above it decreases by 10 ppm? Answer: there isn’t one. We have no measurements for the actual effect of CO2 changes on water temperatures. It’s a model-based assumption. And model-based assumptions aren’t “established physical mechanisms”. Actually, they do show that large CO2 concentration increases that happened for another reason than a warming planet, caused climate to change quite often. What do you believe was the “another reason” that caused large CO2 (4,000 or 5,000 ppm) concentration increases and oft-occurring climate changes? What? Literally all the evidence points to this. Literally all the evidence points to what? Disappearing glaciers in the Himalayas? Catastrophic Antarctic and Greenland ice sheet melt contribution to sea level rise? Coastlines and beaches submerged by sea level rise across the world? What? You really think this is just some conspiracy imagined up by those out to control you, do you? It’s we-agree-so-we’re-right groupthink rooted in confirmation bias. Same reason why the Nobel Prize was awarded to a lobotomist in the late 1940s and by the early 1950s chiseling a hole in patients’ eye sockets with an ice pick and goring out the brain’s frontal lobe was considered “established” medical practice – perfomed 10s of thousands of times. No “conspiracy” was necessary. Just scientists agreeing with each other that they’re right. That is all it takes. ZERO EVIDENCE. and INCAPABLE of producing any. You mean the one that YOU are incapable of describing and backing with anything resembling real empirical science ???? Put forward your understanding (LOL) of this “mechanism” back with empirical science. We are all STILL waiting for you to get out of “demented puppy” mode. Only troll here is you seb. Its your only purpose here. Still waiting to see some actual science from you. Look at your comment. It contains NOTHING ! Well, you went away for a long time. Where is your science? Shouldn’t you present “actual science”? How does the world work? I see you still believe in gravity and discard the radiative properties of certain gases … have you ever talked to an “actual scientist” about that and listened to the reply instead of imagining how he/she is planning to get dupe you? Not one of your posts contains ANY SCIENCE AT ALL. They are SO EMPTY, that all one has to do is draw attention to that fact. … and you are INCAPABLE of producing any. So you don’t think gravity exists. REALLY ???? Hold a 10kg block of steel above your foot and let it go, see if that will dispel your ignorance. A very good example of the average skeptics mindset. But as per Kenneth-logic it’s perfectly fine to doubt that gravity can cause something obvious to happen since it never has been measured in the exact same situation despite the laws of physics not allowing for anything else to happen. So yeah, until you’ve shown that a block of steel above your foot does indeed fall down onto your foot, I’ll believe that there is no gravity at work above your foot. And when you’ve demonstrated this I’ll move the goal post and demand you to show me what happens when that steel block gets released above your foot while you stand on the surface of that exoplanet orbiting Proxima Centauri!